OK, those of you who bet “one week” since the official debut of the newly refurbished Hall of Presidents until we’d have a public issue caught on tape wins the office pool! Yes, friends, those of you who predicted it was correct. On December 27, 2017, a member of the audience decided to loudly chant “Lock him up!” over and over again during the robotic Trump’s speech during a presentation of The Hall of Presidents. A tip of the hat to the audience member who shouts out “he’s not real!” at the two-second mark of the video below. Also, notice that the audience starts to get disruptive towards the end of the video. While I am still working on trying to figure out exactly what happened after the YouTuber stopped filming, it sounds like it could have been a mob scene. Check it out below. This is going to sound like a broken record, but when does Disney throw in the towel at The Hall of Presidents? People continue to show that they can’t control their passion for whoever is in office (this pre-dates President Trump) and it spills into a family attraction. No matter what you think of the President or The Hall of Presidents attraction, Disney hates controversy. And if you’re betting that this will be the only disruption of the new animatronic show, I’ll gladly bet against you. Your thoughts? 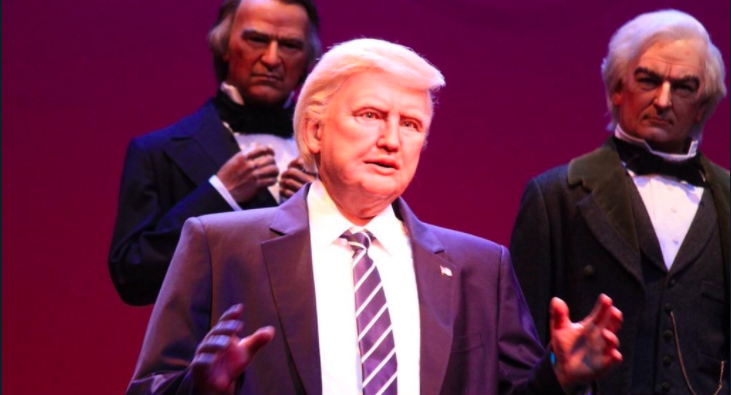 This entry was posted in Disney and tagged Audience Disruption, Donald Trump, Hall of Presidents, Lock Him Up. Bookmark the permalink. Trackbacks are closed, but you can post a comment.